How she'd describe her job to a 10-year-old: "I'm building futuristic computers that will basically let you do many calculations all at the same time." A machine that will 'look like no other': Since 1959, when American theoretical physicist Richard Feynman introduced the concept of using quantum effects for computation, physicists have worked with quantum algorithms and manufactured small numbers of quantum bits (qubits). But until the last few years, the concept of a quantum computer was more science fiction than reality, more physics experiment than business opportunity. Today, the race is on to build a commercially viable quantum computer; Anne and other quantum experts predict it's at least about a decade away. "A quantum computer will not look like a classical computer," Anne says. "This is a machine that's going to look like no other that's been built before." It's not just plug and play: Last year, Intel introduced a 49-qubit quantum computing test chip called "Tangle Lake." Anne's team has successfully run algorithms on small numbers of qubits to serve as example workloads for its development. But to realize quantum computing's commercial potential, the chips will require more than a million qubits. (A qubit is a quantum bit, the counterpart in quantum computing to the binary digit or "bit" of classical computing.) 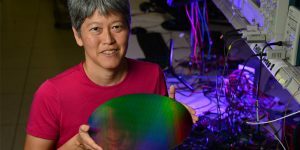 That's a challenge for Intel's manufacturing experts, while Anne and her research team are tackling the formidable challenge of designing the system in which that quantum chip can work. "You can't just take the quantum processor chip, and plug it into a generic quantum computing system because those systems do not exist," she says. "We have to build the whole system here at Intel." That means the physical entity that will house all the system's algorithms, software, architecture, applications, quantum processors -- many of which have yet to be invented. A revolution is coming: Many of today's biggest computational challenges are too complex for even $100 million supercomputers powered by more than 40,000 processors. The promise of quantum computing, however, is that its exponentially greater computing power will enable it to address some long-standing problems in designing new electronic materials, chemistry, medicine and drug design. "Quantum computing may be a longer-term project, but it has the potential to revolutionize computing -- and be very impactful on the world," Anne says. 'Good research leads to good technologies': Anne, who holds a Ph.D. in physics from Stanford University, was originally a researcher in high-temperature superconductivity and has over a decade of experience creating multidisciplinary research programs. In 2015, Intel announced a 10-year, $50 million investment to accelerate quantum computing research in partnership with QuTech in the Technical University of Delft in The Netherlands. Anne often travels from her office in Hillsboro, Oregon, to Delft to work with QuTech quantum physicists and exchange learnings and progress on quantum systems. "I've generally found throughout my career," Anne says, "that good research leads to good technologies, although sometimes it's a technology that's different from the one you're aiming for." The 'impossible' dream: Anne sees her work as akin to the quest of the young boy in the movie "Hugo" to rebuild his late father's robot. Like that fantastical invention, a quantum computer seems "like a nearly impossible machine." But we're making progress, she adds, and the quantum computing community is making great strides towards building what she calls "this magical technology."